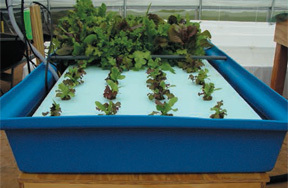 Polytank tray used in an aquaponics plant growing application. Photo courtesy of Nelson and Pade, Inc.
at top 48" x 96"
at top 46" x 93"
sump on bottom 6" dia. x .75" deep.